I found this book on a friend’s shelf, it had Sunday Times Best Seller on the cover so I decided to take it on holiday. It is the last writing of Philip Gould (Lord Gould) and is his account from diagnosis of oesophageal cancer , through radical, invasive medical treatment and surgery to his final days. He writes right up to the end. Gould was an advisor to Tony Blair’s New Labour Party . He was a professor of Economics at LSE. He was driven by many passions. His capacity for work was legendary and he was an inspiration to many.. The start of his book was a harrowing read. He details his treatment options and opts for radical surgery not once but twice followed by periods in intensive care, radiotherapy and chemotherapy. Philip Gould suffered as much as a human being can. It was difficult at times to continue reading and several times I nearly put it down. I am so glad I didn’t. What is extraordinary about this book is his perseverance and ability to give meaning to his predicament without any self-pity. When he realizes that the treatment is no longer working the whole tone of the book shifts from a medical history to another personal/spiritual dimension entirely. I have read many of the great wisdom teachings about Death and Dying and many spiritual texts and meditation practices over the years as it is one of my areas of interest , but here is something, a text, of an entirely different dimension since Gould does not seem to have a spiritual practice to sustain him. He is not a seasoned spiritual practitioner. His life- long interest has been people and politics. The only mention of religion is a reference to a conversation he had with Tony Blair who is a deeply devout Catholic. His purpose then was to write about the process of dying. An increasingly urgent purpose since he did not know how long he had left to life. Was it weeks or days? He needed to articulate his feelings and into the mix of the rollercoaster of emotions came unexpected unsolicited moments of sheer ecstasy and bliss. Life took on a hitherto unknown sharpness of focus honed by the richness of the details of the present moment. Such moments of richness and joy were in sharp contrast to and yet caused by, the ever present imminent proximity of death. “There is ecstasy because I am not dead yet,” he writes. Philip Gould shows us the way to a good death. Despite suffering enormous anguish and physical pain he finds the courage to transcend it all. He demonstrates and lives a good Death and generously allows us to journey with him and to learn from his choices. It is his choices and his attitudes that liberated him. This book is a wonderful teaching for all who read it. Whatever comes your way. You can find the inner strength to transcend it. It’s not easy but whoever said that real transformation would be? 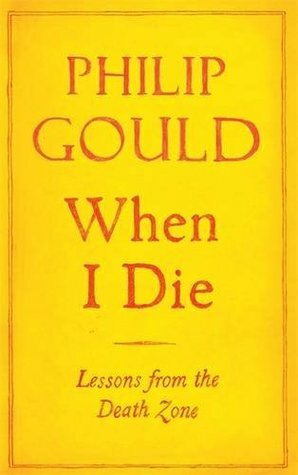 Thank you Philip Gould for your generosity by writing When I Die.